The result of the proceedings on the bail application filed by the leader of the Indigenous People of Biafra,IPOB, Nnamdi Kanu, alongside his co-defendants, Benjamin Madubugwu, David Nwawusi and Chidiebere Onwudiwe, was nothing short of the anticipation of Biafrans as Buhari's maiden media chat on December 30, 2015 resonates at the Federal High Court Abuja presided over by Justice Binta Nyako. The Federal High Court Abuja was agog today as hundreds of Biafrans flooded the court premises from all corners of Biafra land and beyond to cheer and stand in solidarity with their leader, who arrived the court at about 9:45am, Biafra time, alongside co-defendants. Prior to the commencement of proceedings, the Nigerian security agencies left nothing unreserved in exhibition of their uncivilised terrifying features, as several IPOB journalists and reporters were repeatedly harassed and prevented from entering the court room, in accordance with the media blackout ordered by Nigeria president, Muhammadu Buhari. However, few journalists were able to force themselves into the court room after much heated arguments and the intervention of Barrister Ifeanyi Ejiofor, the legal counsel to Nnamdi Kanu. The proceedings commenced shortly after the arrival of the presiding judge, Hon Binta Nyako, the prosecuting counsel, M.S Labaran and other legal representatives of the three other defendants. 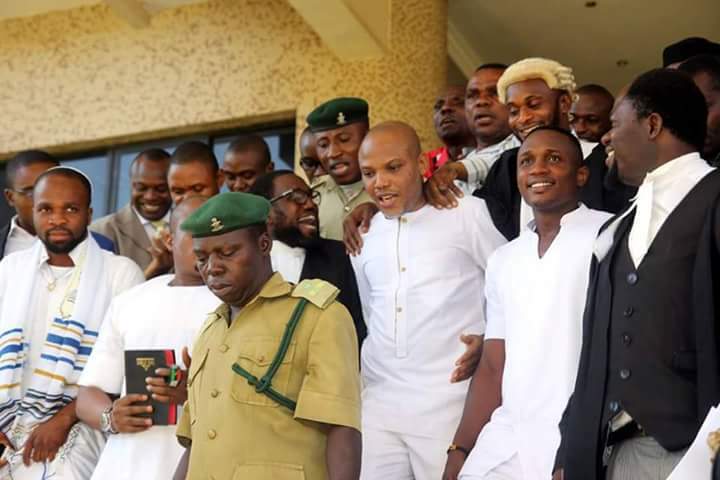 After reading out the arguments of the prosecuting counsel and that of the defense counsels, the judge stated that the charges levelled against Nnamdi Kanu and co-defendants by the federal government attracts the penalty of life imprisonment, if found guilty, therefore the court cannot grant them bail. "If the defendants are found guilty of the charges, they might be sentenced to life imprisonment," Binta Nyako posited against the bail application. By so doing, Barrister Ifeanyi Ejiofor protested that the judge has affirmed the order given by Nigerian President, Muhammadu Buhari on December 30, 2015, which was of the disposition that Nnamdi Kanu can never be released. Meanwhile, Binta Nyako stated that the charges on the accused (Nnamdi Kanu and co-defendants) are too magnanimous for the court to grant them bail. She went further to state that, she will continue with the case if, based on a date picked by the defendant. But the date must be within two months time. Barrister Ejiofor,argued that the first defendant,was falsely attached to the other defendants,which is against section 134. "My lord; The first defendant has being convicted on Media, even before the trial commenced. My lord let them bring their arguments on next week, we are ready for it," Barrister Ifeanyi Ejiofor stated. "My lord, the second defendant has pleaded not guilty. Paragraph 3,4,6 and 7 on page 2, backs my argument of the prosecution's motion, I will like to read if my lord permits me," he requested. "My lord, the accusation against the verdict of guilt, should be proven and established in court." The Judge slightly confused asked: "What is wrong with that? By the way,what is the verdict of guilty?" "My lord, that a gun was found in his house"
The Judge refuted, saying that the accused "don't have to prove it, because that you found a gun in someone’s house, does not mean he has no right to have it." "My lord, I will also argue on fair hearing of the second defendant. It is our duty my lord, to put the law straight. We are lawyers and cannot let it go. "Section 272 is completely consisted with the constitution. The constitutional provision for secret trial is that everyone should leave the court and its done. Not covering the faces of the witnesses," he said. The judge asked the request from the defense counsel is contained in his file, of which he said yes. He however demanded that the application against the second defendant should be scrapped off. He retreated afterwards. "My lord is an international proverb. My lord, the defendant is the Ant and Federal Government is the Elephant, hence the accusation should be trashed out." She concluded. "My lord, in alignment with what my colleague stated, we will not allow a masked witness. The charges against my client, is laughable. "I don't have time next week, but I will look at my diary and set a date. But before that, I will make a ruling on if, masked witnesses will be granted or not"
"My lord, I am surprised that the defending counsel submitted a file to Attorney General, which is against the Law." However, the Judge debunked his argument, as the defending counsel is not against the law. Barrister Ejiofor also debunked the assertion by the prosecutor saying: "My lord we did that because, the prosecuting counsel has been delaying this matter and most a times have not being present in the court, hence need for meeting the Attorney General." After the tensed up arguments, the Judge adjourned her ruling on whether secret trial would be allowed to Tuesday, December 13, 2016. THE WORLD POWERS ARE LOSING CASH AND DEAR PROPERTIES TO BIAFRA FOR DISOBEYING ME, CHRIST IMMANUEL. AS OF MIDNIGHT 30 / 11 / 2016, THESE NATIONS: JAPAN, U.S.A, CHINA,AND GERMANY LOST $300TN( THREE HUNDRED TRILLIONS OF DOLLAR )EACH AS WELL AS LOSING THEIR SEAT OF GOVERNMENTAL AUTHORITIES, LIKE THE WHITE HOUSE IN WASHINGTON D.C, BUCKINGHAM PALACE IN LONDON JUST AS IT APPLIES TO JAPAN, CHINA AND GERMANY. BUCKINGHAM PALACE THE HOME OF THE BRITISH MONARCH THE QUEEN WAS LOST BECAUSE OF BRITAIN REFUSING TO SET MR. NNAMDI KANU, THE IPOB LEADER AND ALL THOSE AGITATING FOR BIAFRA LANGUISHING IN ALL THE NIGERIAN PRISONS, FREE AS OF MIDNIGHT NOVEMBER, 2016. BRITAIN IS ALSO LOSING £120BN( ONE HUNDRED AND TWENTY BILLIONS OF BRITISH POUND )TO BIAFRA. FOR A SECOND TIME, I AM GIVING THESE NATIONS A SECOND CHANCE AND THIS SECOND CHANCE EXPIRES ON THE SEVENTH DAY OF THIS MONTH OF DECEMBER,07 / 12 / 2016. THEY ARE TO CARRYOUT THE SAME ASSIGNMENT I GAVE THEM. IF THEY FAIL, I WILL APPLY THE SAME AMOUNT OF FINANCIAL PUNISHMENT AND THE PROPERTIES OF THEIR FORMER PAST LEADERS WILL BE SEIZED BY BIAFRA FOR THE GOOD AND BENEFIT OF HUMANITY. MAY BE YOU HAVE NOT UNDERSTOOD ME WELL, HAVE IT IN MIND THAT IF THESE FOUR NATIONS I HAD CALLED TO GO AND INSTALL BIAFRA ON NIGERIA SOIL FOR ME, FAILED AGAIN, THE PRESENT AND THE PAST 43 PRESIDENTS THAT HAVE RULED USA INCLUDING THE INCOMING ONE, MR DONALD TRUMP, WHO IS A WITNESS OF THIS MY COMMAND WILL LOOSE THEIR PROPERTIES CASH AND FIXED ASSETS. YES, IF BY MIDNIGHT OF THE 07 / 12 / 2016 AND THESE NATIONS HAVE NOT DONE WHAT I COMMANDED THEM TO DO ABOUT BIAFRA INSTALLATION, BARAK OBAMA, THE OUT GOING PRESIDENT OF USA AS WELL AS THE CURRENT PRESIDENT ELECT LOST THEIR PROPERTIES, WHEREVER THEY EXST ON THIS EARTH. WHICH IS THE SAME FOR THE OTHER NATIONS INVOLVED EXCEPT ISRAEL, WHO IS MEANT TO LEAD THEM. THE BRITISH GOVERNMENT MUST MAKE SURE THAT MR. NNAMDI KANU OF THE IPOB AND ALL THOSE AGITATING FOR BIAFRA ARE SET FREE FROM THE NIGERIAN PRISONS. THEY MUST NOT BE JUDGED BY ANY COURT IN THIS WORLD. I HAVE JUDGED THEM AND FOUND THEM NOT GUILTY OF ANY CHARGE IN RELATION WITH BIAFRA ISSUE. 11 I saw heaven opened, and look! a white horse. And the one seated on it is called Faithful and True, and he judges and carries on war in righteousness. 12 His eyes are a fiery flame, and on his head are many diadems. He has a name written that no one knows but he himself, 13 and he is clothed with an outer garment stained with blood, and he is called by the name The Word of God. 14 Also, the armies in heaven were following him on white horses, and they were clothed in white, clean, fine linen. 15 And out of his mouth protrudes a sharp, long sword with which to strike the nations, and he will shepherd them with a rod of iron. Moreover, he treads the winepress of the fury of the wrath of God the Almighty. 16 On his outer garment, yes, on his thigh, he has a name written, King of kings and Lord of lords. GO TO MY FACEBOOK PAGE: FACEBOOK.COM/AKUNNA.DIKENAG AND BE ABREAST OF MY ACTIVITIES.